Because we need luxury dining in the North! The launch of Hugo’s Restaurant in the picturesque town of Speightstown is akin to manna from heaven! Touted as “ Something HUGE is coming to Barbados” the modern beachfront eatery did not disappoint. From start to finish, the experience was simply magical! Hugo’s officially opened their doors on December 22 but invited guests were welcomed for a much-appreciated pre launch. You must understand that Hugo’s packs a strong visual punch from entry to seating. 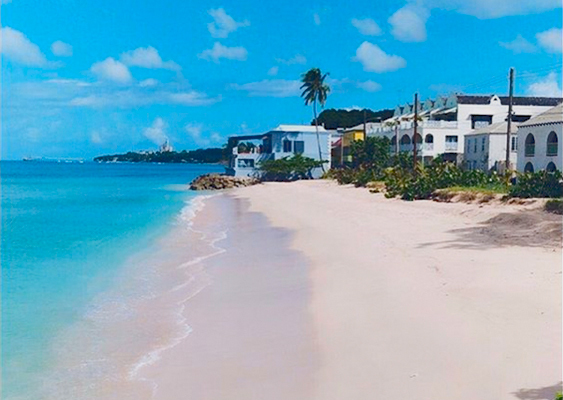 On approaching through quaint Speightstown, your eyes are immediately drawn to the trendy monochromatic structure, set at the end of a white sand beach. Twinkling standing décor reminiscent of Caribbean coral fans adorn the walls of the upstairs balcony and provides a softening to the grey hues. On arrival, you may wonder about parking but this was handled by well-outfitted gentleman – our valets for the evening. Upon entry, the distinctive H for the Hugo’s brand adorning the wall teases of the modern ambience to come. Entry through pristine glass doors, led to hosts bearing trays of red or white wine and crystal flutes of bubbling Prosecco. Once my eyes were drawn away from this refreshing welcome, the dazzling blues of the Caribbean Sea were a perfect compliment to the subtle elegance of the décor. Hugo’s is cleverly set upon two levels. The bottom level on where I now stood provided open-air seating and a modern air-conditioned lounge, sectioned off by clear glass walls to ensure that vistas of the sea remain uninterrupted. Graciously bid to “explore wherever I liked” I proceeded to take advantage of this once in a lifetime offer. Naturally, I started with the air-conditioned lounge. Because…who does not love cool comfort! The warmth of outside was not unpleasant as the bottom level is well covered and the breeze from the ocean was crisp and cool. As the doors to the lounge were held open for me, I feasted my eyes on the ambience. I could clearly see that much attention was paid to finding the perfect balance of comfort and class. Soft couches, perfect for relaxing with friends or your significant other, were ideally positioned with a well placed bar adjacent to the seating. The chill of the room was just right and milling waiters offered me a refill of smooth red wine. Not to be charmed into staying into the comfort of the modern lounge I decided to visit the upper level, to see if it was as delightful as the bottom level. Simply put. Yes, it was! As you ascend the stairs, you are greeted by two cleverly designed female eyes, one literally winks at you on the wall, while pink potted chrysanthemums line the staircase. Absolutely chic and oh so gorgeous - A must see! Upon reaching the top level, I was now able to get a closer view of the unique standing décor on the walls, which to my surprise now twinkled with pretty lights as sunset neared. The view beyond these was simply breathtaking, un parralled. The timing was so perfect, I was able to witness the orange hues as the sun gently set for the evening. To the left - the sea is on your right upon reaching the crest of the stairs. The VIP room was intimate and refined. Decorated with stately green chairs finished in rich wood grain and a glittering chandelier graced the ceiling. Recessed lighting and a trio of modern pictures added to the atmosphere. Absolutely delightful. To my delight, a lovely evening was completed when the canopy was fully retracted to reveal a cloudless starry sky. We were served a selection of oh so delicious bites, then mouthwatering desserts while a live musician sang effortlessly in the background. The service was great, our hosts gracious and did I say, my glass was never empty? Even the bathrooms were spacious and glittered with modern décor, spotless in perfection. A drive to Hugo’s is ultimately worth it. It refreshes the palate. A romantic walk on the beach is the perfect nightcap to a newly opened treasure in the north.